Hello everyone. Today’s Photo Blogging Challenge was “Pop of Color”. I had originally planned to photograph three hedge apples in the kitchen. 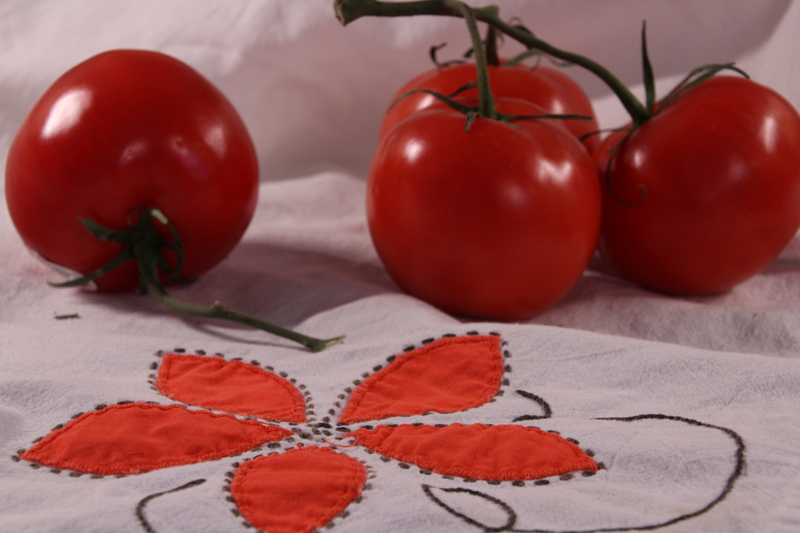 This dish towel was on the towel bar, and these tomatoes were on the counter, so I created a small still life to showcase the wonderful color. The lighting was great, streaming in from a couple of windows and reflecting on the luscious skin of the fruit. I hope you enjoy! This photo might make you hungry, so I’ve linked to a recipe for Tomato Bisque Soup. Have a creative day. Use some color! Chili sounds delicious. Thanks for the idea Donna!